Charming, remodeled home 1 block from Main St.
Property Size 1,320 sq. ft.
You will fall in love with this adorably hip and friendly home that sits one block from Bozeman's vibrant Main Street! 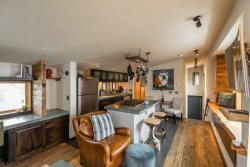 Feel instantly at home in this warm and inviting gem that sits right in the heart of downtown convenient to Bozeman’s local restaurants, pubs, wine bars, coffee shops and art galleries. Recently renovated, enjoy an updated kitchen and bathrooms in this 1800's house (not to mention all new windows, electrical and plumbing!) . The main floor living and dining rooms are accented with hand-crafted woodwork. The updated and large kitchen is decked out with an exposed brick wall, soap-stone counters, farm-style sink, gas stove, stainless-steel appliances, breakfast bar and French doors out to the fenced backyard (loved by our four-legged guests!). The master bedroom has an attached bath with the original claw foot tub and new shower. No worries if you have a hard time getting in or out of this classic tub as there is also a second, newly remodeled bathroom on the main level that has a great walk-in tiled shower. The dining room seats six around a large, beamed table. The upstairs has one bedroom, dog-house dormers that make it feel cozy along with an additional room that is great spot for kids to hang out. This room also has a futon for extra sleeping space. And finally, the gear room is the perfect place to hang your Patagonia, Prana or Ibex swapping out your snow boots for slippers or Chacos for Haviana’s. The home is decorated with Kelly's personal touches from her travels around the world – art from Ireland and Bhutan, light pendants from Turkey and books signed by local authors. And there is also convenient off-street parking available through the back alley! The new heating system, insulation and windows ensure this historic home is cozy and warm in the winter. The TV has a digital antenna for local channels as well as Hulu, Netflix, Pandora, YouTube and other streaming capabilities. And the high-speed wifi will help you plan all your Yellowstone adventures. Also take advantage of the many dimmer switches throughout the home to set the perfect vibe for times spent with family and friends. A little about the owner – an Iowa native, Kelly moved to Bozeman for Montana State University’s program in Science and Natural History Filmmaking. She fell in love with this home and its location in Bozeman's historic center right away living in it through graduate school. She is now sharing it as a vacation rental because her work in the fields of film, law and international human rights have temporarily taken her to Holland. From Amsterdam she regularly travels throughout Europe, Asia and the Middle East working to help human rights advocates to use video to expose the truth and hold those most responsible for human rights abuses accountable. She is very excited to be able to share her home with others until she and her dogs, Ruby and Tingo, return to live in their favorite mountain town where they can easily explore all of what the Greater Yellowstone landscape has to offer – from the clear-water rivers to the high mountain peaks. Taylor was courteous, and timely with all the information we needed. The property manager was great. I thought I didn't receive check in instructions (I did - it was buried in my email) so I sent them a message and received an immediate phone call with the date and time the email was sent. Taylor was great! Also it snowed on our trip and first thing in the morning folks were there shoveling. I was very impressed! It was a great location and really made our Bozeman trip that much better. Amazing. Taylor Morrison was incredible. I had to call for a couple minor reasons, and she fixed them immediately. She also was following up via email to make sure all was well. Absolutely incredible customer service. She could NOT have been better. We loved it, it was perfect to be so close to town and walk everywhere. We really enjoyed the Home in the Heart of Bozeman. Everything we needed was close by and Bozeman has so much to offer.